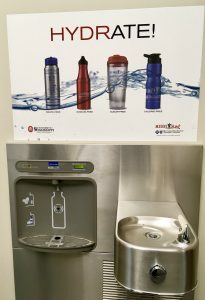 With multiple Hydration Stations on campus, Faculty and Staff have access to cold, filtered water for free! Most of your body is made up of water, so it is important to maintain a good level of hydration in order to keep your body functioning properly. 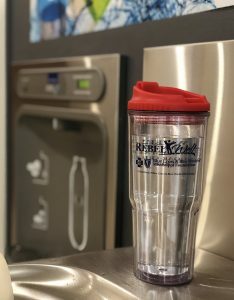 Water is essential for a variety of processes that keep us healthy, including regulating body temperature, removing toxins through urine, controlling heart rate and blood pressure, protecting organs and tissues, and transporting nutrients and oxygen. Neglecting to replenish your fluids can lead to several short-term and long-term negative health effects. Staying hydrated does not necessarily mean you have to drink 8 glasses of water a day.The amount of water a body needs will be different for every person and will depend on that individual’s day-to-day activities and overall lifestyle. Be mindful of how your body functions and any changes you notice, and do not ignore signs of dehydration.Certain foods contain a high percentage of water, including cucumbers, lettuce, broccoli, tomatoes, melons, strawberries, and several other fruits and vegetables. Including these foods in your diet in addition to drinking lots of water will help keep you fully hydrated. Keep a water bottle with you at all times and sip it throughout the day. Make it a habit to drink a glass of water after you wake up. Include low-sodium soups in your meals. Be aware of changes in your environment, such as drier climates, that may cause your body to lose more water. Make sure that you are well hydrated before engaging in activities that will cause your body to lose water. Dehydration occurs when you do not consume enough water to keep your fluid levels balanced. You lose water from your body every minute just from regular breathing, sweating, or using the restroom. You can be at risk for dehydration even if you are not engaging in vigorous activities.